Pub tucked away on a side street in Canonbury, not too far from Highbury And Islington Station. 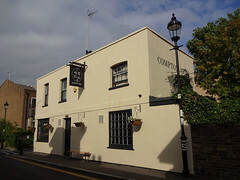 Note: According to WhatPub, as of mid-2018 the Compton Arms has changed hands. We've only made a very brief visit since this happened (they were opening an hour later than intended, and we weren't able to hang around) and so although we can confirm that as of September 2018 it's open again, some or all of the details below may be out of date. It's rather untypical of Islington, being small, cosy, and friendly. It looks very small as you enter, but there's another (cramped) area with seating for about 16 people accessed by going around the left hand side of the bar. It also has a small beer garden (smoking permitted) out the back with a number of tables and some high stools. bob, Kake, and Liz visited on a Saturday evening around 5:30pm; we liked it enough that we came back the same evening around 9pm after dinner at Le Mercury down the road. Although the place was lively enough, we had no trouble getting a table either time. The service was friendly anyway, but got even friendlier when the Welsh barman realised that Kake and Liz were Welsh too. Very nice pub, and quite a find for the area; as well as its general niceness, its location on a side street helps stop it getting too rammed, since you have to know it's there. There were four beers available in December 2007: Greene King IPA (£2.80), Abbot Ale (£3), Davenports(£3.10) and Batemans XXXB. On a visit in August 2009, two of the pumps were on, serving Abbot and IPA, with the other two off (LBW and Sun Dance were on the clips, suggesting that two have rotating guest ales). Draught lagers are basic, as well as Beck's Vier. Food is served noon-2:30pm and 6pm-8:30pm Tuesday to Friday, and noon-4pm Saturday and Sunday (no food Mondays). It's all simple pub food, but good value and perfectly decent. Ewan's vegetarian burger (£5.50) photo wasn't too dry, and came with plenty of chips and a couple of onion rings. Last visited by Ewan and friends, August 2009. Last edited 2018-09-12 14:37:36 (version 22; diff). List all versions. Page last edited 2018-09-12 14:37:36 (version 22).